For additional news posting select “VHC Site” in the Search for News by Category box to the right. As of the September meeting, the Arlington County staff are scoping out the studies which may last from 6 to 9 months and will largely be conducted by consultants. Current expectations are that the costs may be $1 million, which has not been allocated. The County Board is expected to approve the funding in November by allocating some unused end of year 2017 funding (year ended June 30). Prior to the results of the studies being brought to the County and School Boards there will be significant opportunities for public input. Transfer of the ownership of VHC site is likely to occur in the summer of 2018. The VHC has committed to relocate the Urgent Care and getting the Arlington Pediatric Center to another location(s) in south Arlington. Scenario A – The Carlin Springs site would include four different activities. About 40% of the space all along the eastern side of the property for either passive or active recreation. About 25 % of the space on the north west corner would be a structure for fire department reserve vehicles. These are not ones which make calls but are in for periodic service; for every vehicle at stations ready to respond there is ½ a vehicle in reserve. 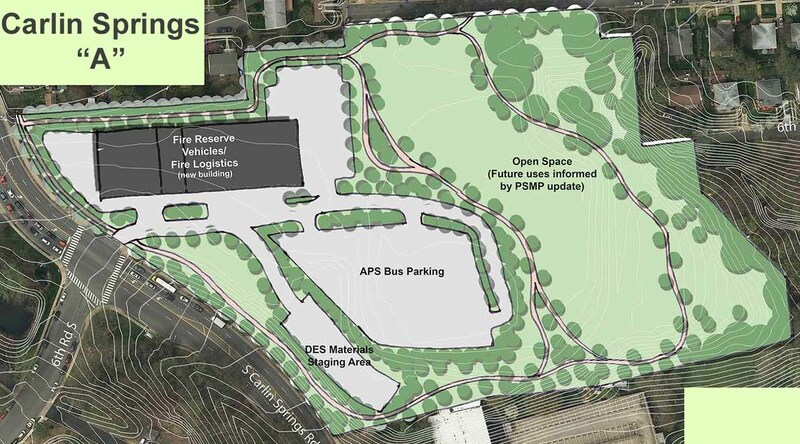 The other 35% of the property would be for Arlington Public Schools (APS) bus parking, in the center, space for Department of Environmental Services materials staging (e.g. for road and other construction and maintenance) along the south western side of the property. The actual uses for the open space would be consistent with the updated Public Spaces Master Plan. The scenario includes a buffer to the single-family neighborhood to the north, screening of proposed uses and a pedestrian network encircling the property and potentially connecting to 5th Rd. South, which will be beneficial if it improves access to an expanded Glencarlyn Park and the Nature Center. Scenario C – This scenario is more flexible for long term use with no permanent structures in the near term. About 30% of the space all along the eastern side of the property for either passive or active recreation. Approximately 30% of the property space along the northwestern side for school seats for elementary or middle school needs, or this could be swing space for School or County needs. 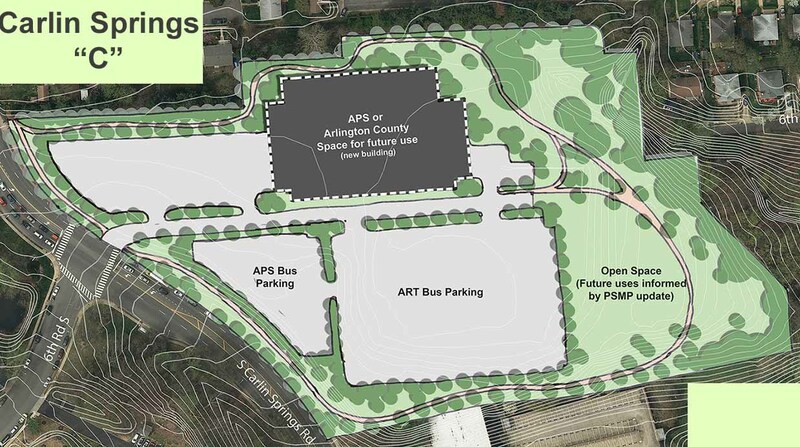 The remaining 40% would provides for APS and ART surface bus parking. Since surface parking does not require a substantial investment, the property could easily be repurposed for other structures in the future. Traffic and Safety Issues – There were numerous comments and questions about the study of traffic and safety to pedestrians. Ms. Cristol reiterated the areas that would be covered in the Phase 3 analysis (see above). She committed to ensuring that the traffic studies would be sure to fully capture the traffic during the peak times of the year. On the question of whether the studies would include the potential use of the site as a future school facility, she said she would get back to us; she did note that study for that use at this time would not be useful if planning for a school on that site is more than 5 years away. It was suggested that the traffic study look at the addressing traffic on Carlin Springs from where it was coming, i.e. from Fairfax, and seeing if steps may be able to deal with it there. Why can’t Arlington park buses outside of the County? Are there other places within the Arlington to park buses? In particular land that is currently vacant, in areas such as Potomac Yard. The County is continuing to determine if they can find locations for bus parking other than on the Buck or VHC Urgent care site. The issue is that if buses are located well outside of the county there is at least a $6 million per year operational cost added because of the added time and distance they need to travel. For more information go to JFAC’s webpage at: https://commissions.arlingtonva.us/jfac/.